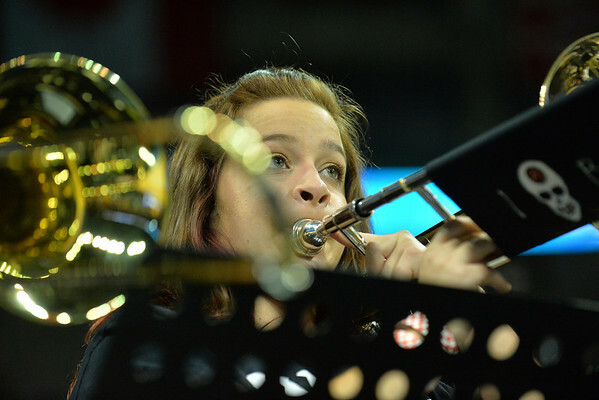 March 22, 2014: A member of the San Diego State Aztecs pep band plays during a third round game of the NCAA Division I Men's Basketball Championship between the 4-seed San Diego State and the 12-seed North Dakota State at Spokane Arena in Spokane, Wash. San Diego State defeated North Dakota State 66-43 to advance to the Sweet Sixteen. 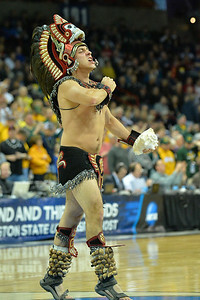 March 22, 2014: The Aztec Warrior performs during a third round game of the NCAA Division I Men's Basketball Championship between the 4-seed San Diego State and the 12-seed North Dakota State at Spokane Arena in Spokane, Wash. San Diego State defeated North Dakota State 66-43 to advance to the Sweet Sixteen. 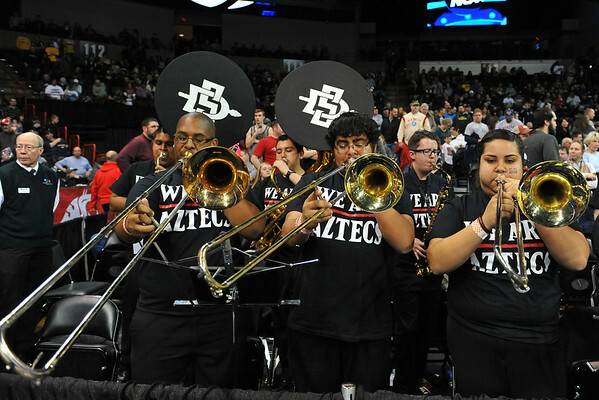 March 22, 2014: The San Diego State Aztecs pep band plays during a third round game of the NCAA Division I Men's Basketball Championship between the 4-seed San Diego State and the 12-seed North Dakota State at Spokane Arena in Spokane, Wash. San Diego State defeated North Dakota State 66-43 to advance to the Sweet Sixteen. March 22, 2014: A San Diego State Aztecs cheerleader performs during a third round game of the NCAA Division I Men's Basketball Championship between the 4-seed San Diego State and the 12-seed North Dakota State at Spokane Arena in Spokane, Wash. San Diego State defeated North Dakota State 66-43 to advance to the Sweet Sixteen. 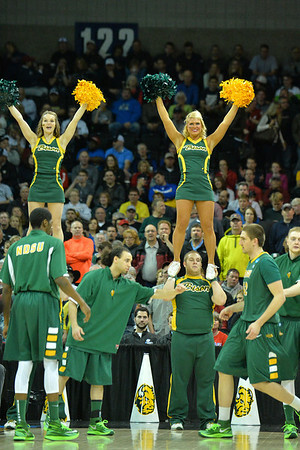 March 22, 2014: North Dakota State Bison cheerleaders perform during a third round game of the NCAA Division I Men's Basketball Championship between the 4-seed San Diego State and the 12-seed North Dakota State at Spokane Arena in Spokane, Wash. San Diego State defeated North Dakota State 66-43 to advance to the Sweet Sixteen. March 22, 2014: San Diego State Aztecs cheerleaders perform during a third round game of the NCAA Division I Men's Basketball Championship between the 4-seed San Diego State and the 12-seed North Dakota State at Spokane Arena in Spokane, Wash. San Diego State defeated North Dakota State 66-43 to advance to the Sweet Sixteen. 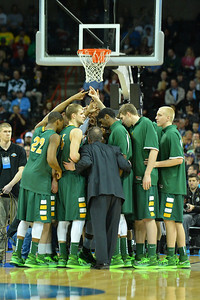 March 22, 2014: The North Dakota State Bison huddle before the tip off of a third round game of the NCAA Division I Men's Basketball Championship between the 4-seed San Diego State and the 12-seed North Dakota State at Spokane Arena in Spokane, Wash. San Diego State defeated North Dakota State 66-43 to advance to the Sweet Sixteen. 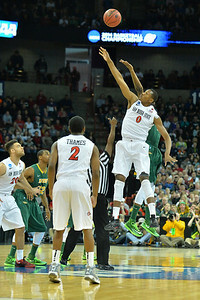 March 22, 2014: San Diego State Aztecs forward Skylar Spencer (0) wins the tip off during a third round game of the NCAA Division I Men's Basketball Championship between the 4-seed San Diego State and the 12-seed North Dakota State at Spokane Arena in Spokane, Wash. San Diego State defeated North Dakota State 66-43 to advance to the Sweet Sixteen. 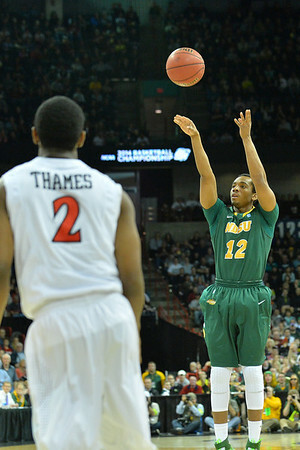 March 22, 2014: North Dakota State Bison guard Lawrence Alexander (12) shoots a three pointer during a third round game of the NCAA Division I Men's Basketball Championship between the 4-seed San Diego State and the 12-seed North Dakota State at Spokane Arena in Spokane, Wash. San Diego State defeated North Dakota State 66-43 to advance to the Sweet Sixteen. 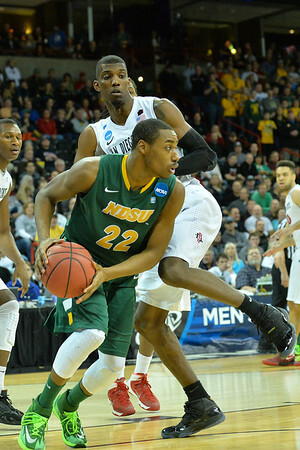 March 22, 2014: San Diego State Aztecs guard Xavier Thames (2) guards North Dakota State Bison guard Taylor Braun (24) during a third round game of the NCAA Division I Men's Basketball Championship between the 4-seed San Diego State and the 12-seed North Dakota State at Spokane Arena in Spokane, Wash. San Diego State defeated North Dakota State 66-43 to advance to the Sweet Sixteen. 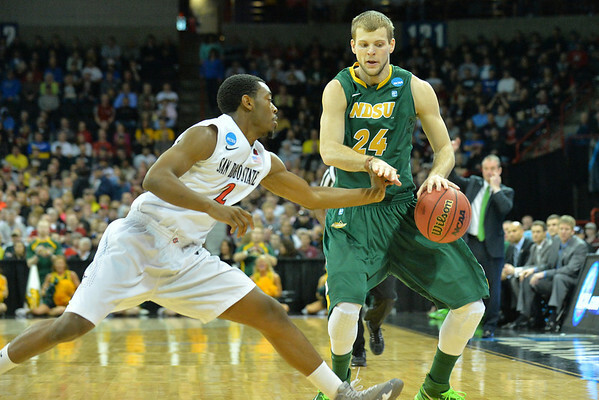 March 22, 2014: North Dakota State Bison guard Kory Brown (22) tries to get around the San Diego State Aztecs defense during a third round game of the NCAA Division I Men's Basketball Championship between the 4-seed San Diego State and the 12-seed North Dakota State at Spokane Arena in Spokane, Wash. San Diego State defeated North Dakota State 66-43 to advance to the Sweet Sixteen. 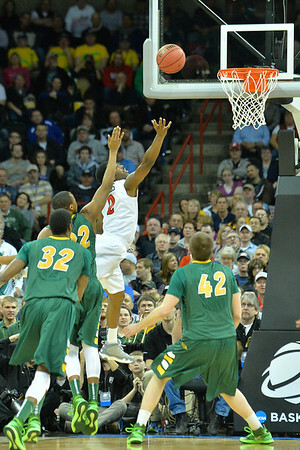 March 22, 2014: San Diego State Aztecs guard Xavier Thames (2) puts up a shot during a third round game of the NCAA Division I Men's Basketball Championship between the 4-seed San Diego State and the 12-seed North Dakota State at Spokane Arena in Spokane, Wash. San Diego State defeated North Dakota State 66-43 to advance to the Sweet Sixteen. 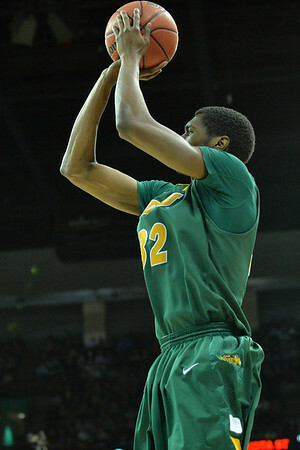 March 22, 2014: North Dakota State Bison forward TrayVonn Wright (32) takes a shot during a third round game of the NCAA Division I Men's Basketball Championship between the 4-seed San Diego State and the 12-seed North Dakota State at Spokane Arena in Spokane, Wash. San Diego State defeated North Dakota State 66-43 to advance to the Sweet Sixteen. March 22, 2014: North Dakota State Bison cheerleaders celebrate a Bison basket during a third round game of the NCAA Division I Men's Basketball Championship between the 4-seed San Diego State and the 12-seed North Dakota State at Spokane Arena in Spokane, Wash. San Diego State defeated North Dakota State 66-43 to advance to the Sweet Sixteen. 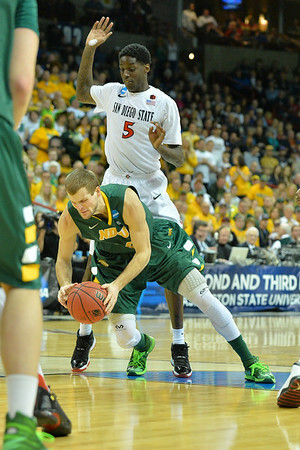 March 22, 2014: San Diego State Aztecs forward Dwayne Polee II (5) tries to keep the ball away from North Dakota State Bison forward TrayVonn Wright (32) during a third round game of the NCAA Division I Men's Basketball Championship between the 4-seed San Diego State and the 12-seed North Dakota State at Spokane Arena in Spokane, Wash. San Diego State defeated North Dakota State 66-43 to advance to the Sweet Sixteen. 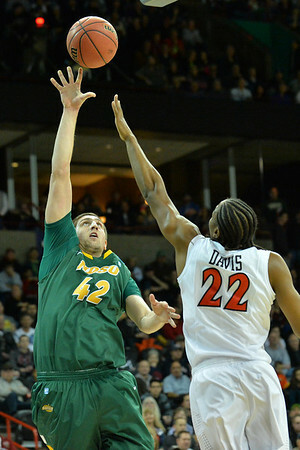 March 22, 2014: North Dakota State Bison forward Marshall Bjorklund (42) shoots over San Diego State Aztecs forward Josh Davis (22) during a third round game of the NCAA Division I Men's Basketball Championship between the 4-seed San Diego State and the 12-seed North Dakota State at Spokane Arena in Spokane, Wash. San Diego State defeated North Dakota State 66-43 to advance to the Sweet Sixteen. 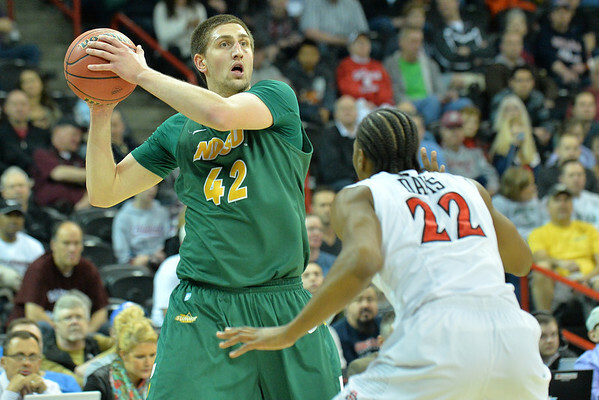 March 22, 2014: North Dakota State Bison forward Marshall Bjorklund (42) surveys the defense during a third round game of the NCAA Division I Men's Basketball Championship between the 4-seed San Diego State and the 12-seed North Dakota State at Spokane Arena in Spokane, Wash. San Diego State defeated North Dakota State 66-43 to advance to the Sweet Sixteen. 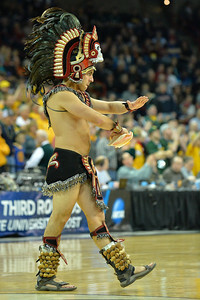 March 22, 2014: A member of the San Diego State Aztecs cheerleaders performs during a third round game of the NCAA Division I Men's Basketball Championship between the 4-seed San Diego State and the 12-seed North Dakota State at Spokane Arena in Spokane, Wash. San Diego State defeated North Dakota State 66-43 to advance to the Sweet Sixteen. 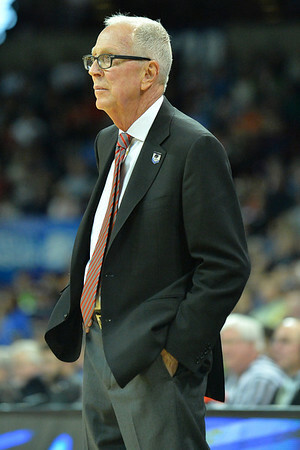 March 22, 2014: San Diego State Aztecs head coach Steve Fisher watches the action during a third round game of the NCAA Division I Men's Basketball Championship between the 4-seed San Diego State and the 12-seed North Dakota State at Spokane Arena in Spokane, Wash. San Diego State defeated North Dakota State 66-43 to advance to the Sweet Sixteen. 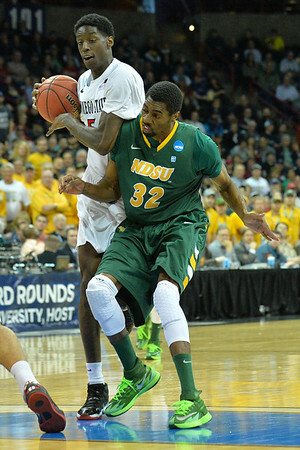 March 22, 2014: North Dakota State Bison guard Taylor Braun (24) is fouled by San Diego State Aztecs forward Dwayne Polee II (5) during a third round game of the NCAA Division I Men's Basketball Championship between the 4-seed San Diego State and the 12-seed North Dakota State at Spokane Arena in Spokane, Wash. San Diego State defeated North Dakota State 66-43 to advance to the Sweet Sixteen.